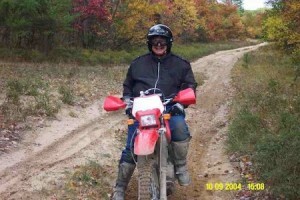 Even though a CCC member for several years I had only used the membership to obtain the Michigan ORV Trail system map book (well worth the $25 membership fee) to plan an occasional ride with some out of state riding friends. Believing fifty something was too old to ride anymore I sold my scoot. After three years of regretting it I bought another one. Reluctant to ride alone yet determined to “get back out there” I attended the 2004 Rites Of Spring event at Whiskey Creek. Figuring out of 600 plus riders I could find someone to tag along with that was within my skill level. Dual Sport riding is a whole new world! No pressure, no race, no trophy, no red flare and 500 bikes take off, no officials, no checker flag at the finish and not as easy as it looks! Basically, it’s like an enduro with no checkpoints and no time keepers. Riders are given a map to tape to their tank or a roll sheet similar to an enduro one that has mileage and arrows pointing which way to turn and a description of what type of terrain it is two track, dirt, paved road, gravel, etc. If you have a GPS the whole ride can be downloaded into that! Some of the experienced guys had a home made dashboard mounted to their crossbar that had a roll chart on the left, speedometer/mileage counter/trip meter in the center, and a GPS on the right: ultra cool! So there you are, cooking down a two track, winding the roll chart, checking the GPS, and looking for the correct direction every time you come to fork, crossroad, etc. All this at speed mind you. During sign up, a member of Great Lakes Dual Sporters offered to take me out on the loop and I’m very glad I took him up on it. Turns out Jim is a very experienced dual sporter and has laid out many a course and written many a roll chart. After another member, Keith, helped me install my “very first” roll chart, we met up with yet another member, John, under the “Big Tree”, set our odometers to zero and rode off. Jim on a KTM 400 and John on his KTM 450. I tried hard to read the roll chart and with Jim’s coaching, did learn a lot, but was no match for these guys experience. My new Honda XR400 performed brilliantly! My last bike was a 1981 XR 500. I cannot believe what 20 years of technology has accomplished with these machines. The modern suspension and frame geometry make for a much easier (and safer) ride. My skills are rusty and confidence level is not up there because I had no idea what the machine would do. I was using stock suspension settings and 14 pounds of air in each tire. Have not got the sandy hairpin turns figured out and was somewhat timid. At one of the gas stops I dropped two pounds out of the front tire and that gave me more confidence to stuff it into the turn and gas it. I held my own with these guys, mostly because all I had to do was ignore the roll chart and follow. Although a “newbie” to dual sport I do have trail riding experience. Man, what a thrill! I’m talking 5th gear on the gas, pine trees whicking by on both sides, just gittin’ it down these two tracks! Every time they stopped to look for me I was parked right behind them with a big grin on my face! It was like I had been riding with these guys for years. They were much more comfortable with their equipment and have lots more recent saddle time with the new technology but soon as I get this Honda figured out and learn how to read a roll chart and GPS while on the gas in 5th gear, I’ll be the guy out front leading the way! There I go getting competitive again but it’s not that kind of ride. The cool thing about this sort of riding is that there are so many different types of terrain to traverse. Just about the time you think “man I’ve had enough of this” the course will switch to a wide hard packed sand road or a couple miles of pavement, so you have time to relax, look for deer, eagles, turkey and other wildlife before diving back into the woods again. The riders are a great bunch of people. We stopped several times and talked to others on the side of the trail. Picked up one guy and his buddy from Illinois who had driven 400 miles to the event. One rode a Yamaha and the other a Husaberg. They were practicing to ride the 1200 mile Upper Peninsula Dual Sport Safari later this summer. They rode with us for a while and we even had lunch together but eventually they went their own way. Met some Ohio riders with Suzuki’s, a guy on a big Kawasaki 650, and other people too, some even riding two up! It’s so cool just start talking about their bikes or equipment or any ole thing, it ain’t no race so there ain’t no pace! The maps indicate lots of cut offs and ways to bypass the rough terrain if that’s your style. We waved to people we passed in cars on tight roads and to people picking mushrooms or working in their yard at the occasional cabin located near a lake or something. We would go past quietly and respectfully then throttle up when the coast was clear. We called it quits before completing the 150 mile first day loop. About every ten miles you RESET TO ZERO as instructed on the roll sheet and we completed 11 resets for a total of 122 miles! And guess what? These dudes are in their 50’s and 60’s!!! That’s a really cool thing about this sport because maturity has its merits when it comes to knowing how to treat people, being respectful of the land and others on the trail. Everyone rides at their own pace. Without experienced guides to follow I would have been forced to ride much slower (which is just fine) but even though I finished the day with a bit of pine branch hanging from under my number plate I didn’t fall down. It’s still there and I might just leave it there as my “Red Badge of Courage” and souvenir of a truly awesome riding experience. Sadly, I did not ride the 110 mile loop the next day. Truth is, I was too pooped and too sore to push myself any further. But now I have the motivation to put aside the cookies and TV and get myself back into shape! Bottom line: you gotta try this Dual Sport thing! I can honestly say it’s everything I have been looking for. If nothing else I will discover some great trails to ride and collect maps and route sheets along the way. But a bonus for riding the events are the great prizes given away at the end of each days riding, plus you get to see a bazillion different set ups on these machines. I like to go “old school” wearing bibs and a sweatshirt, but no way am I going to give up this XR400 until they make one with an electric start!